Third album of Swedish 90's Eurodance quartet also have recieved special Mirumir "deluxe" treatment. Originally released in 1998, this newly mastered edition spreads on 2 LPs and includes complete album plus a lot of rarities and b-sides. Second album from Swedish pop wonder Ace of Base "The Bridge" contains new hits such as "Beautiful Life", "Lucky Love", and "Never Gonna Say Im Sorry". This double LP Deluxe Edition contains the complete album in its original sequence, plus rare track Love For Sale, extended versions of top album hits and a heavy-metal version of Never Gonna Say Im Sorry. 8th album by legendary German disco-trio Arabesque, originally released in 1983 for the Japan market only. Includes the hits Loser Pays The Piper, Dance Dance Dance, Pack It Up, and Sunrise In Your Eyes. This Deluxe Edition contains 6-page full color booklet with lyrics and rare photos, packed in a silver foil sleeve. Arabesques third LP, "Marigot Bay" (also known as "Arabesque III"), was released 1980 and was a little unusual one in the sense of the music itself. All in all, Disco was four of five years old and had become a little unfashionable to the general public. So, now we can call "Marigot Bay" "an album where Euro Disco was born" - the dance rhythms and the singers natural charms were reinforced with things unusual for the pure American Disco style, specifically the rocknroll guitar and vocal stylings. So the glorious results: "Jingle Jangle Joe" sounded very much like a remake of Chers 1966 hit "Bang Bang (My Baby Shot Me Down)" and "Take Me Dont Break Me" is a true rocknroll tune with a Disco beat. And one more thing: "Marigot Bay" was the very first album in the history of Disco where the songs have quite serious lyrics, not just "dance, dance, dance..." But the ballad "The Only Night Was A Lonely Night" stands head and shoulders over all the other songs on the album, and it was one of the most popular Arabesques tracks in then-USSR. This latest Mirumir re-issue is a truly deluxe one: all songs are remastered from the analog tapes, sleeve design restored on silver foiled card paper and theres 8-page booklet with song lyrics and rare band photos. The fourth Arabesque LP, "Midnight Dancer" (initially released as "Arabesque IV" back in 1980) may be called "that song album" in all former USSR states. Its quite paradoxical, but the title track (we mean "Midnight Dancer" here) wasnt released as a single in then-Western Germany or Japan, and even wasnt placed on the Soviet Arabesque Greatest Hits LP. Anyway, "Midnight Dancer" became not just a main song of Arabesque in Russia back in the 80s, but it still one of the Eurodisco symbols here up to now. This song collection is a little bit more straightforward than "Marigot Bay" - most tracks are very danceable with tempo around the classic 120 bpm for the best of any discotheque itself. This Mirumir re-issue is a real deluxe one: all songs are newly remastered from analog tapes, sleeve design fully restored on silver foiled card paper and LP comes with 8-page booklet with song lyrics and rare band photos. 9th and final album by legendary German disco-trio Arabesque, originally released in 1984 for the Japanese market only and now a real collectable item. Includes the hits Time To Say Goodbye, and Ecstasy. This Deluxe Edition contains 6-page full color booklet with lyrics and rare photos, packed in a silver foil sleeve. 7th album by legendary German disco-trio Arabesque, originally released in 1982 for the Japanese market only. Includes the hits Why No Reply, Don't Fall Away From Me, and Young Fingers Get Burnt. This Deluxe Edition contains a 6-page full color booklet with lyrics and rare photos, packed in a silver foil sleeve. 180 gram gatefold LP. The sixth studio full-length album of leading Russian folk / pagan metal band is a masterpiece, no less. In fact "The Word" (2011) is a heavy metal parallel to a old Russian myth about three sister rivers. Those musical three rivers are old school European folk metal, traditional Russian folk songs as well as choir and orchestra arrangements for the very first time in Arkonas history. But keen rock fans can found even symphonic metal and progressive rock elements here to their delight. All in all "The Word" is a highly original and fresh-sounded folk metal album even for experienced ears, and its cover design created by famous Belgian pagan artist Chris Verwimp. So its nothing strange that Arkona last year shared the stage with such style icons like Therion all over Europe. Originally released in The Netherlands in 1990 on a long out of print - and now $150+ on eBay - 2LP, Mirumir is pleased to present this collection of classic Artemiev film scores as two separate and single 180 gram LPs in what are, in our humble opinion, far more beautiful and breathtaking covers with better sound quality than the original. Recorded in Moscow in 1989-90, these are re-recordings of Artemiev's soundtracks to three classic 1970s Tarkovsky films. At the time of its release in 1990, there were no legitimately available versions of the original soundtracks and Artemiev chose to fill that void in the market with these re-recordings. With these two LPs and the recent reissue of the Solaris soundtrack MIR100705, and the forthcoming Mirror/Stalker original remastered soundtrack, all officially licensed from the artist himself, Mirumir is now home to the definitive collection of electronic pioneer Artemiev's most heralded work. Originally only available on a ultra-rare Japanese bootleg, Mirurmir is incredibly pleased to announce the first official issue of the groundbreaking and mind blowing soundtrack to Tarkovskys masterpiece, Solaris. Composed by the electronic music pioneer, Edward Artemiev, Solaris was the first project in what proved to be a fruitful collaboration between director and composer. An absolutely essential piece of electronic music and Russian cinema history, lovingly reissued in a gorgeous gatefold package including previously unseen photos from the Tarkovsky archives and a cover pulled from the Italian poster for the film. Remastered from the original film soundtrack and pressed on high quality 180 gram vinyl. Challenger is the first and only album from disco project Baby's Gang - one of the most talked about items among collectors of Italo disco. Their first hit tune, "Happy Song", appeared in 1983 and was so beloved by Boney M producer Frank Farian that he included a cover version on their LP "Kalimba De Luna". When it arrived a couple of years later, the full album was a whole platter of hits. After a few more years, in 1988, their final single was the hit "Disco Maniac", after which the creative activity of the project ended.This MIRUMIR LP, in addition to new mastering and high-quality printing, includes two additional tracks that were not on the original album: the original version of "Happy Song" (recall that in the remix album came out in 1985) and a maxi-version of "Disco Maniac". The second album by the phenomenally popular 80s group Bad Boys Blue, "Heartbeat" was originally released in 1986 and is BACK on vinyl with remastered sound and with high quality embossed sleeve and poster. It features a couple of international hits, "Kissed And Tears" and "I Wanna Hear Your Heartbeat". MIRUMIR music publishing create a Deluxe edition, which everyone will want to get, even if they have an original LP. Attention, Eurodisco fans! The classic 80's sound is back on vinyl! Bad Boys Blue, one of the most important pop bands of that era, is again available on deluxe edition audiophile vinyl, remastered sound, with high quality embossed sleeves and posters. The first album "Hot Girls, Bad Boys", released in 1985, features top International hits "Youre A Woman" and "Pretty Young Girl". My Blue World is the fourth studio album from German disco and synth-pop legends Bad Boys Blue and features the singles "A World Without You (Michelle)", "Dont Walk Away Suzanne", and "Lovers in the Sand". This would be the last album with original lead singer Trevor Taylor (aka Supa T). Though it was not nearly as big a chart success as some of their earlier and later albums, its highly regarded among fans of Euro disco and Hi-NRG. Another classic from Bad Boys Blue reissued by Mirumir. The Fifth is the first Bad Boys Blue album without original lead vocalist Trevor Taylor. Original member John McInerney took complete control of the band at this point and is still to this day the only original member performing with Bad Boys Blue. The group toured extensively across Europe for this album, on the success of the singles "Lady In Black" and "A Train To Nowhere" and the album was a hit, especially in Eastern Europe where they remain hugely popular. Another Euro disco and synth-pop classic from Bad Boys Blue reissued by Mirumir. Gatefold 180 gram 2LP. 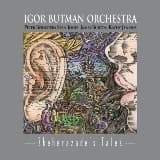 Recorded live in 2010 at the Cherry Wood Art Festival in Moscow, Sheherazades Tales found world-renowned Russian saxophone player Igor Butman-along with prominent NY jazz artists Sean Jones, Kathy Jenkins, Peter Bernstein and James Burton-presenting a crossover program featuring Nick Levinovskys jazz arrangements of the symphonic suite "Sheherazade" by the celebrated Russian composer Nikolai Rimsky-Korsakov, along with two songs from the Russian Gypsy tradition, "Dark Eyes" and "Coachman, Dont Rush The Horses", as well as the American jazz standard, "Caravan". Executed with impeccable style and ingenuity, this original fusion of classical music and jazz was enthusiastically received by audience and critics alike. 180 gram LP + FREE bonus CD of the album. Impossible to find album, reissued for the first time ever on vinyl!!! 1979s Sei Note In Logica is Italian experimental composer Roberto Cacciapaglias second LP, a minimalist album that features one continual composition "for four voices, computer, and orchestral ensemble", in the same vein as Fred Rzewski, Steve Reich and Terry Riley. Unlike anything else coming out of Italy at the time, Cacciapaglia (who worked for Italys national Department of Phonology) is also quite advanced in his use of computer-based technology. A major influence on the likes of Jim ORourke and others of his ilk. 180 gram LP + FREE bonus CD of the album. An influential member of the Italian avant-garde, Roberto Cacciapaglia has spent the last four decades blurring the lines between classical and electronic music, developing a sound that has never been restricted by genre. A classically trained pianist and composer from Milan, Cacciapaglia first came to prominence in the early seventies as keyboardist for the king of experimental Italian pop, Franco Battiato. After recording his own debut LP, 1975s Sonanze in Milan, Cacciapaglia traveled to the Ohr /Cosmic Couriers studios in Cologne to mix the results under the watchful of eye of krautrock overlord Rolf-Kaiser Ulrich (Tangerine Dream, Klaus Schulze, Ash Ra Tempel). The resulting album was a mix of electronic (moog, synth) and classical instruments (guitar, oboe, trombone, clarinet) that was experimental in the cosmische sense, but with the musical chops and vision of a classically trained musician. Every 80s kid remembers the hits "Get Up, Action", "Go Go Yellow Screen" and "Dont Stop" by the Dutch studio outfit Digital Emotion, that was on the same wave as Trans-X, Patrick Cowley, Divine and other Hi-NRG artists of 80s. As well as Video Kids, L-Vira and X-Ray Connection, Digital Emotion was a studio project created by Cat Music production team (who was also responsible for Catapult and The Monotones). Nowadays, an original LP is highly desirable for all disco collectors, but its almost impossible to find a good copy, as it all was played to death at the time. This new Digital Emotion reissue on Audiophile Clear Vinyl will fill the gaps in disco collections. Classic British hard rock album from 1974 featuring Brian Johnson (the voice of AC/DC) is back in stock with this completely new edition. Exceptional quality and full analog mastering from the original master tapes from Gold Note Records engineers released on Tape2Disk - new audiophile sublabel of Mirumir Music Publishing. Hard rock never sounded better! One of Englands longest-enduring heavy metal bands, Hawkwind was formed during the late 60s, just as art-rock was coming into its own. They combined bold guitar, synthesizer, and Mellotron sounds, creating heavy metal music that seemed to cross paths with Chuck Berry and the Moody Blues without sounding like either of them. Here you can listen the legendary psychedelic rockers performing live at Londons Astoria on the 19th December 2007 at their annual London Christmas gig. Features founder Dave Brock and the return of keyboardist Tim Blake. Project Koto, one of the main Italo disco legends from the 80s until now had in their discography one "blank spot", which is now filled in by the Mirumir label.Koto became popular in the early 80s and released several very successful singles on their own label Memory Records (where, by the way were releases from Baby's Gang, Ken Laszlo and other popular Italo disco performers). However, things were going badly at the company, so the entire roster (along with the brand Koto) was sold to the German company Bernhard Mikulski. Because of this, all of the early hits on their debut album, "Masterpieces" were presented in the form of remixes and remakes, while the original versions remained scattered on inaccessible singles and compilations. Mirumir, with the kind permission of ZYX Music GmbH, presents the album "The Original Masterpiece", which brings together the very original versions of hits that first brought glory to Koto. Future Generation is the first and most successful album of the Dutch Italo disco / spacesynth project from producer Eric Van Fleet and Michiel van der Kuy. Laserdance incorporates soulful cosmogony, space and Jean-Michel Jarre, putting it on a Hi-NRG-rail a la Patrick Cowley and other pioneers of synthesizer dance music. The album was first published in Holland in 1987, where it was warmly received by the audience and sold nearly 150 thousand copies. Future Generation, often called the "bible of spacesynth", significantly increased interest in music in this genre. Reissued on LP. Gianni Coraini, better known under the pseudonym Ken Laszlo, released only one album in the eighties but that has not prevented him from being one of the more beloved artists of the Italo disco scene. Ken Laszlo can be compared with such bright stars of the 80s disco scene as Savage or Fancy. The first release in Europe became a hit single. "Hey Hey Guy", was released in 1984 under the pseudonym Ken Laszlo. His songs "Tonight", "Glasses Man", "Dont Cry", and "1,2,3,4,5,6,7,8", all published under the same pseudonym, also became big hits in discos across Europe and beyond. The S/T debut album which includes all those tracks and more is reissued here on LP! The Monotones were a one-off studio project of Dutch glam rock band Catapult, who decided to move into the dance scene in the end of 70s. Their one and only LP was a positive mixture of obscure space-disco Rockets-esque tracks, rock nroll and pseudo-Russian track "Disco Njet Vodka Da", that was bands first disco single in 1977 (before Boney Ms "Rasputin" and Dschinghis Khans "Moskau"). This release contains all 6 tracks from their debut LP plus 3 instrumental cuts and the minor hit "Cheap Cheap Cheaper" from 1982, newly mastered and collected together for the first time. Mirumir Music Publishing proudly presents the world's first soundtrack to the mobile game, released on vinyl! The soundtrack for Rovio's Angry Birds Go! game is not quite the usual soundtrack. Recorded with dozens of live instruments, from the guitars and drums to theremin, saws and roasting pan with beef steak (full list of almost 100 instruments listed on the inner sleeve), this soundtrack contains more music than was used in the game, and even more than on the iTunes release. The incredible neo-psychedelic retro-funk groove from Pepe Delux, who started in the late 90s with trip-hop and downtempo, deserves to be listened on a high quality audio system, rather than built-in speaker phone. Guest list includes such eminent persons of the world music scene as a keyboardist of Yngwie Malmsteen's Rising Force and Stratovarius' Jens Johansson and most famous accordionist in the World, Kimmo Pohjonen. Its first original LP issue of Italo Disco star Roberto Zanettis "lost" second album, which was recorded for Baby Records back in 1984, but never released properly due to labels demise. Some of its tracks were presented on "Strangelove" CD (1994) anyway. But our issue presented all albums songs on one LP for the very first time. And theres more - three non-album singles tracks ("I Just Died In Your Arms", "Dont Leave Me" and "Goodbye"), as well as inner sleeve with songs lyrics, full recording credits and rare photos. All tracks are remastered by one of the leading Russia sound experts Evgeni Gapeev. For the fans of: Italo disco.